This article is about the character. 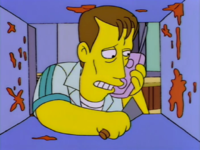 For the guest star, see James Woods. "What do you mean, I gotta give two weeks' notice? Why you frickin', no good, mother [beep] [beep] cheese! ...No, not you, I'm just talking to my oven." ―Woods experiences the daily grind of Kwik-E-Mart life. James Woods is an American actor. Woods is hired as Apu's replacement at the Kwik-E-Mart after he is fired; he takes the job because he is researching for his next movie. Woods struggles to adapt to the role and eventually leaves the job when the character in his movie is changed. He gets the Kwik-E-Mart bosses to give the job back to Apu, as a thank you for saving Woods' life from a robber at the store. Woods is hired as Apu's replacement at the Kwik-E-Mart after he is fired for selling Homer Simpson spoiled meat and failing to blame it on "a scapegoat or sacrificial lamb." Woods wishes to take the job because he is playing a convenience store clerk in his next movie and so wants to research the part to be able to give a better performance: "I kind of like to research my roles and really get into it". As a method actor Woods goes to very extreme lengths for parts, for example saying that for the film Chaplin he "actually traveled in time, back to the twenties." Woods struggles with the job, as Jimbo tells him he was a "little labored" in giving him his change and he needs to "lose [himself] in the moment". Woods angrily tries to get Jimbo to do the change giving 'scene' again, much to his confusion. Later, while he is fiercely cleaning the cheese out of his microwave oven, his agent Tony calls to explain that Woods' character in his next movie has been changed to a "jittery eskimo firefighter". Woods plans to quit the Kwik-E-Mart to go and live in an igloo, but Tony points out he needs to give "two weeks' notice". When Apu returns to the Kwik-E-Mart to face his demons, Woods lavishes him with praise, saying "you're like the guy, you're a legend around here" and explaining that he has been studying Apu's old security tapes for help. Then, a Robber enters the store, instructing Woods to hand over money. When he recognises who he is, he says his next song will be "number three with a bullet". As Woods explains he is an actor not a singer the robber shoots him, only for Apu to dive in front and take the bullet. Apu survives as the bullet bounces off another bullet already lodged inside him. As a token of his gratitude for his life being saved, Woods gets Apu his old job back, before leaving to "battle aliens on a faraway planet", in what he implies is not a movie. 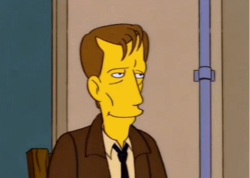 A picture of James Woods was seen on the wall of Springfield Sardi's. James Woods from Springfield and James Woods from Quahog spoke to each other at the Springfield Court House during the Duff vs. Pawtucket Patriot Ale trial. 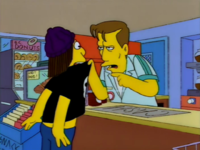 The Springfield James Woods told the Quahog James Woods that he worked at the Kwik-E-Mart to research a role. Woods' role in the episode is a reference to Michael J. Fox's character Nick Lang in the film The Hard Way (1991), a film in which Woods also stars. Woods' role was originally written for Michael Caine. ↑ Martyn, Warren; Wood, Adrian (2000). Homer and Apu. BBC. Retrieved on 2008-08-17. ↑ Mirkin, David. The Simpsons season 5 DVD commentary for the episode "Homer and Apu" [DVD]. 20th Century Fox. Modified on October 10, 2017, at 10:37.